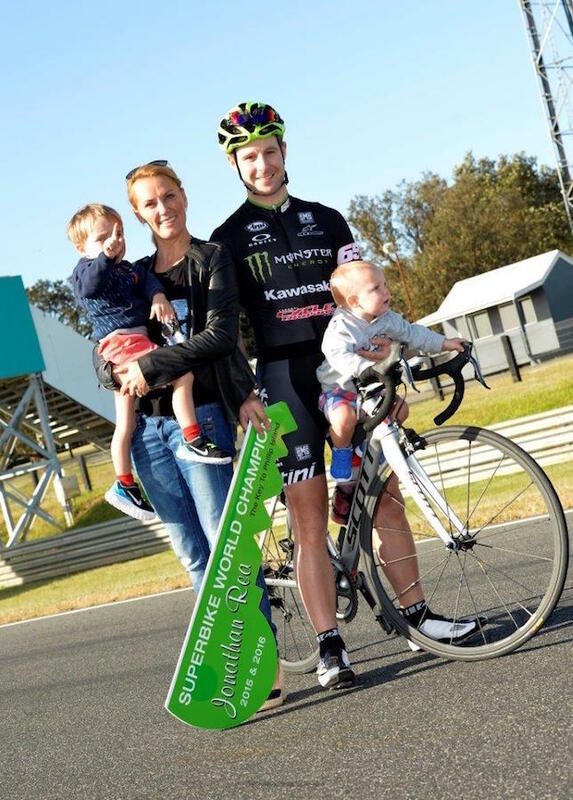 Recently crowned 2016 Superbike World Champion, Jonathan Rea, returned to Australia with his family this week after a title-winning year in Europe. Out on a training ride this morning with his Phillip Island cycling buddies, a quick diversion to the famous Grand Prix circuit led him to Bass Coast Mayor, Cr Pamela Rothfield and a start grid surprise where he was presented with the Key to Phillip Island. Rea – who hails from Northern Ireland, is married to Phillip Islander,Tatia Weston, and holidays on the island with their sons every summer – was busy showing his training mates the fastest way around the thrilling 4.45km circuit when he was halted on the main straight by Cr Pamela Rothfield, circuit managing director, Fergus Cameron, and a crew of local school children from Cowes Primary. The Phillip Island contingent had decided to make Jonathan’s association with the island a little more official. After congratulating the Kawasaki rider on his second world championship – a back to back effort for Jono with 2015 and 2016 crowns now under his belt –Cr Rothfield awarded him with the Key to Phillip Island and invited him to accept “adopted citizen” status of the picturesque isle. Surrounded by his proud family, Tatia and sons Jake and Tyler, his cycling mates and a bunch of Cowes school kids the motorcycle rider could not help but say yes and with typical Irish humour took on his newly claimed Aussie status with a chuckle of surprise and delight. The kids then hauled him onto their school bus and took him to the Phillip Island karting track where they had a gift to unveil, his own Jonathan Rea Go Kart liveried in Kawasaki green, complete with race number 1 and his name proudly emblazoned across the front. “That was a massive surprise with my cycling mates. We pulled into the circuit and I got awarded the key to Phillip Island and got some special recognition from the community which was so nice,” said Rea after his morning surprise. “I really consider Phillip Island my second home. My wife was born here and lived her for many years and it’s nice to come back. To double win last February here was amazing. It’s always the best round of year for me and we have it in the summer here which is incredible. Rea already has the goal of a hat trick three world championships in 2017 and is looking forward to racing his new up-spec 2017 model Kawasaki ZX-10RR. “I’m looking forward to a new challenge for me, for 2017. No one has even won three championships in a row, so that’s now my target,” said Rea. “It’s going to be tough, I mean the competition is hard but there’s no better place to start than here after winning the two races here last year and my good form here. “It’s a target I set myself, but we have to respect our competition, there’s so many other faster guys but we just need to focus on ourselves with Kawasaki we have an incredible bike and I’ve got a lot of home support here as well so I’m looking forward to kick starting the season at Phillip Island and I really hope a lot of people come to watch. When asked on his impressive effort at the recent Jerez test, where Rea aboard his 2017 Kawasaki topped the time sheets of not only world superbike but MotoGP riders, Rea was humble. “Our categories are really different. I mean we race a production based bike that you can theoretically buy from a Kawasaki dealer turn into a race machine like mine, whereas the GP guys are a full prototype. “But actually we were faster in Jerez, not slower, faster than the pole position lap time of Valentino Rossi which was incredible for me to not only to be mentioned in the same breath. These MotoGP guys are my heroes. 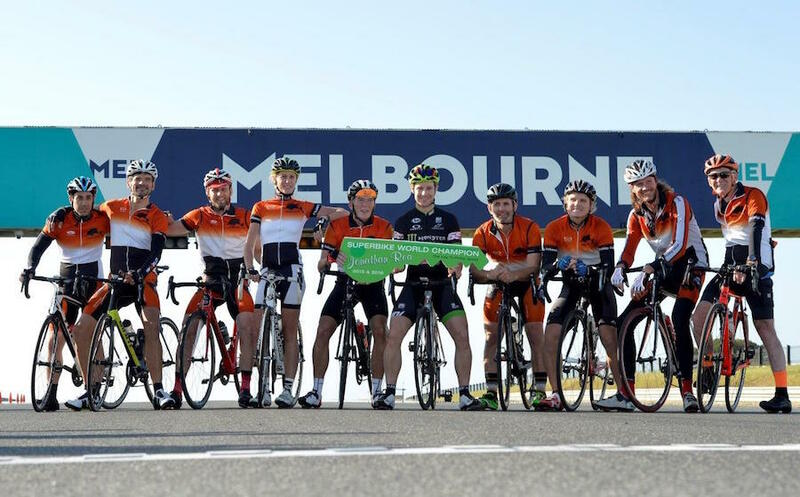 Jonathan Rea is happy to be back in Australia and loves cycling each morning with his group of buddies. “I love cycling and the guys here! Phillip Island is such a beautiful place. Jono launched his title winning years of 2016 and 2016 with victory at Phillip Island’s season opener. In February of this year, Jono sealed a perfect start at the island with a double win and left for 13 rounds of racing in Europe, Asia and America with an established lead. His was never challenged for the top spot aboard his Kawasaki, and finished the 26 race championship with an impressive 23 podiums and nine wins. He took his second Superbike World title on 498 points in the final round in Qatar in October, with team mate Tom Sykes on 447 points in second, and third to Chaz Davies (445 points) after a late season rampage on the Ducati. Tickets for the Yamaha Finance round of the WorldSBK at Phillip Island are available through Ticketek, with a three-day general admission pass costing $120* – a saving of $35 over the gate price. BarSBK passes, for undercover viewing locations at some of the most spectacular parts of the circuit, are $260*, while adult single-day passes cost $30 for Friday, $65 for Saturday and $80 for Sunday. Camping is available for up to four nights for $105*. Best of all, children aged 15 and under enter for free and camp for free, making the event affordable for families of all sizes. For more information ring the Superbike Hotline on 1300 728 007 or visit www.worldsbk.com.au or Ticketek. AMCN's News Editor Chris Dobie has just wrapped up a two day test of the new Ducati Multistrada 1200 and 1200S at the world launch in Spain.